We have known for some time now what the Alfa Romeo 4C looked like via the company images introduced last month but today’s Geneva debut marked the first time that the 4C has faced the public. While the big Suisse motor show brought about the formal introduction of the new Alfa in the flesh, the company has offered very few specifications on the sleek little sports coupe. What we do know about the Alfa Romeo 4C is that it is a 2 seat sports coupe with a rear wheel drive, mid engine design that should make it an incredible car in terms of handling. When the new 4C arrives in American Fiat dealerships, will be powered by a 1.75 liter 4-cylinder engine sending the power to the rear wheels via a twin clutch automatic transmission. Unfortunately, parent company Fiat has not announced what kind of power the turbocharged engine will make nor have they told us how many gears the twin clutch transmission will have…although we know that the driver will be able to shift the 4C manually with a set of steering wheel mounted paddle shifters. We also know that the Alfa Romeo 4C is 46.5 inches tall, 78.7 inches wide and 157.5 inches long with a 94.5 inch wheelbase but the most important vital number – weight – remains unspecified. Early reports suggested that the company was targeting a weight of 1,874 pounds but more recently, the rumors have suggested that the 4C could weigh somewhere in the area of 2,200 to 2,500 pounds. The company has promised that the new Alfa 4C sports coupe will have a power to weight ratio of less than 4 kilograms per horsepower; which is less than 8.8 pounds per horsepower to American buyers. 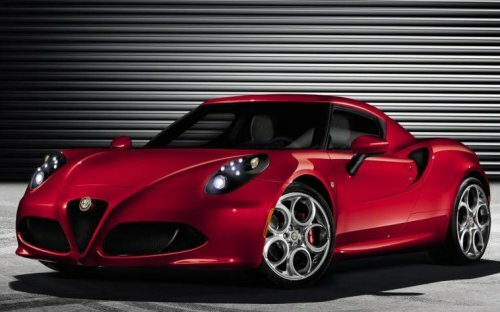 If the 4C weighs 2,200 pounds, hitting a power to weight ratio of 8.7 (because that is less than 8.8) pounds per horsepower would indicate that the sporty Alfa will need around 252 horsepower. Should the weight creep up around the 2,500lb mark, the 4C will need around 287 horsepower. The same 1.75 liter turbocharged engine at work in the Alfa Romeo Giulietta makes 232 horsepower and it has been widely expected that the 4C would pack at least 250 horsepower so hitting that 8.7lb/hp mark shouldn’t be very hard – especially considering the fact that the 4C will be comprised almost entirely of carbon fiber and aluminum. There hasn’t been any official pricing information offered so far on the Alfa Romeo 4C but rumors suggest that it will cost between 50,000 and 60,000 Euros. In US dollars, that is $65,210 to $78,108. Putting aside the fact that this is an exotic midship sports car with Italian luxury inside and Italian driving dynamics throughout, that price range may be a little high in the US market. When you consider the fact that the 2013 Ford Mustang GT offers a power to weight ratio of roughly 8.6 pounds per horsepower and it starts around $30,000, the 4C likely won’t be a first choice for those most concerned about going fast. The Alfa will likely offer superior handling over the American muscle cars but if the price indeed starts in the 60k range – the 4C will be competing with the likes of the new Chevrolet Corvette in the US marketplace. However, those prices are purely speculation for the sake of discussion and without any concrete power numbers available right now, it is hard to say exact what the 4C will compete with when it hits dealerships around the US later this year. The 2014 Alfa Romeo 4C will be built at the Maserati plant in Modena Italy and the company expects the first models will be available for sale within the 2013 calendar year. We will bring you more information as it becomes available but in the meantime, click any of the thumbnails on this page to check out our full Alfa Romeo 4C gallery.